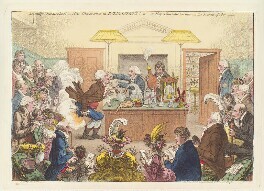 Born and raised in Massachusetts, Thompson arrived in England in 1776, where he conducted experiments with gunpowder. 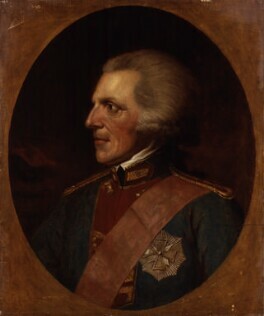 He served (1780-81) as undersecretary of the colonies, and later entered the service of the elector of Bavaria. 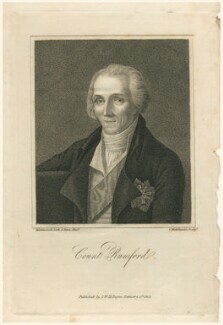 He was knighted in 1784 and in 1791 was created count of the Holy Roman Empire. Returning to England in 1795, Thompson introduced improvements for chimneys and fireplaces and invented the double boiler, and the kitchen range. 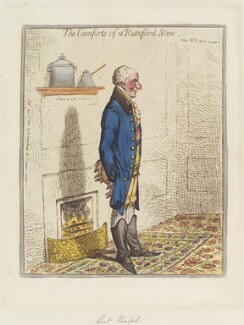 He developed a more accurate theory of heat, claiming in a paper he presented to the Royal Society in 1798, that heat was produced by the motion of particles, contradicting the accepted caloric theory of heat. 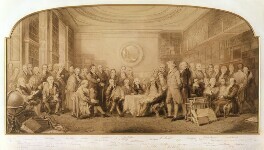 He founded the Royal Institution in London in 1799.